I was surprised to find that I had not read a single Jeffrey Archer. Since I no longer save the best for the last I decided to dive into his most well-known supposedly earth-shattering novel : Kane and Abel. First things first, I am now a Jeffrey Archer fan. His story telling has a very classic characteristic to it; simple and yet gripping. As he volleys between Kane and Abel (The two protagonists) my bias towards each kept swinging. Both are very likable characters even if they could not have been from more different worlds. Kane comes from a world where he is born with the proverbial golden spoon while Abel is from a poverty stricken family. Yet they have a lot in common: Both have a drive to be outstanding, their own battles to fight and both always take them head on. Abel’s early life is marred by a lot of suffering, a lot more than Kane. But I found myself rooting for Kane (if I had to pick one). Perhaps the name change from Wladek to Abel was off putting too. What I liked is that we are told of their stories from their birth all the way till the end and it was interesting to see their dreams evolve and how they try to achieve them, never ceasing in effort. Neither of them rarely do anything repulsive yet they both commit mistakes, some peccadillos, others worse. Both of them could have ruined their life with what they were given-Kane with his richness and Abel with his suffering and yet they don’t. Neither has an easy life. I had to feel for Kane, nothing he does ever seems enough. Things are always expected of him and to his credit he does achieve them. For me he becomes a better man than his perhaps cold father. I loved the parallel between the two and I was waiting when their worlds clash. Things really heat up in the second half. Now to the writing itself. The narration in ‘Kane and Abel’ is strong and the plot is always ticking. What I found is that Archer blatantly violates the golden ‘rule’ of writing i.e, ‘Show, don’t tell’. The novel is basically a telling, a narration, but it is a good telling. On the downside I expected there to be more face-offs between the two given the title but there weren’t. I expected the book to be better than what it was. When you hear so much about a book and read the book’s description that says it sold millions of copies etc. etc. you really go in with great expectations. If I had just picked ‘Kane and Abel’ without knowing anything about it’s history it would without doubt have been a memorable novel and it still is but I don’t see what the fuss is about. However I am extremely glad I read it. 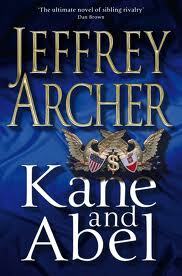 This entry was posted in Books and tagged Book review, Jeffrey Archer, Kane and Abel on June 9, 2014 by iluvryuzaki.